Rainfall in September was confined to the early part of the month and by sampling day, rivers were back to summer levels. Samplers reported moderate-flow conditions and low turbidity on sampling day, although the Ruston Bridge site had no perceptible flow. Ammonia levels (Figure 1) were low this month with, one MODERATE status, two GOOD status and five HIGH status values. Orthophosphate levels (Figure 2) were, again, high this month, with one MODERATE and five POOR status values. 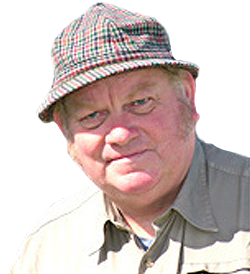 Nitrate levels (Figure 3) were low this month, with one Moderate and seven Good rankings; all three Shortbridge Stream sites had zero values. The highest reading was at Ruston Bridge, which had a Moderate ranking. Dissolved oxygen levels were, again, excellent this month with a clean sweep of eight HIGH status values. Values for Turbidity, Conductivity and pH were all within normal parameters, although turbidity was slightly higher at Ruston Bridge, in common with the previous two-month’s results. The three-monthly tally shows a continuance of high levels of orthophosphate, especially in Searles Lake Stream where we measured one BAD value, four POOR values and one MODERATE value. 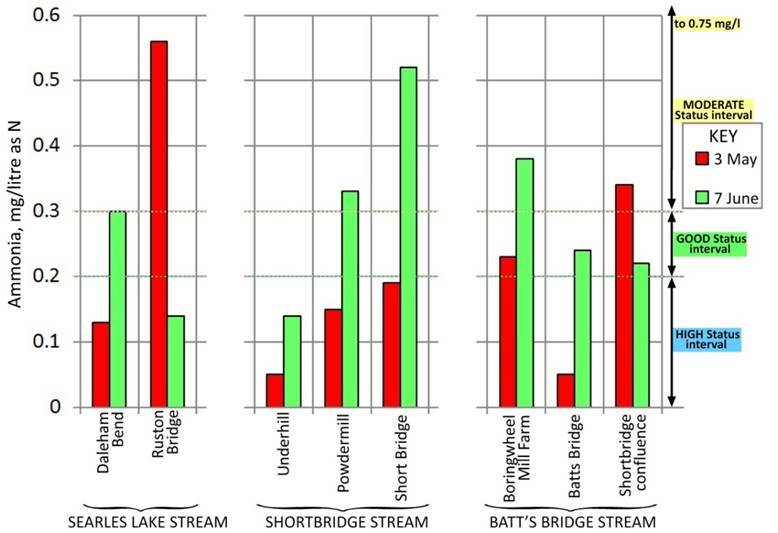 For Batt’s Bridge Stream, an important sea trout spawning stream, there were six POOR values and three MODERATE values; Shortbridge Stream also recorded six POOR values and three MODERATE values. The persistence of high levels of orthophosphate in these three waters is a matter of great concern to OART. Also of great concern was the extremely high level of ammonia measured in Searles Lake Stream at Ruston Bridge on 6 September. The only sewage treatment works discharging into these waters is the Maresfield discharge into Batt’s Bridge Stream and this affects only two of the sites: Shortbridge confluence and Short Bridge. We can only assume that high levels of phosphate at the other sites are from agricultural sources, or private sources not connected to mains sewage. The high level of ammonia at Ruston Bridge in September remains unexplained. Figure 1. 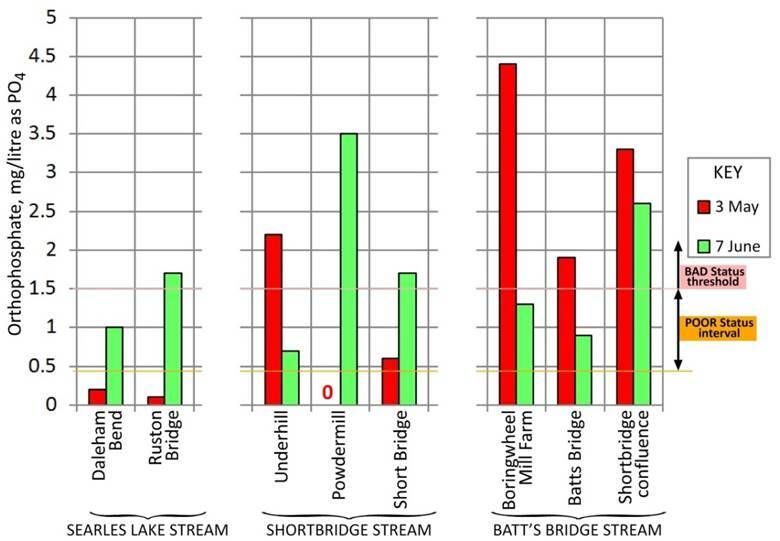 Ammonia levels in Searles Lake Stream, Shortbridge Stream and Batt’s Bridge Stream: comparison of samples taken on 4 October with those taken on 2 August and 6 September. Figure 2. 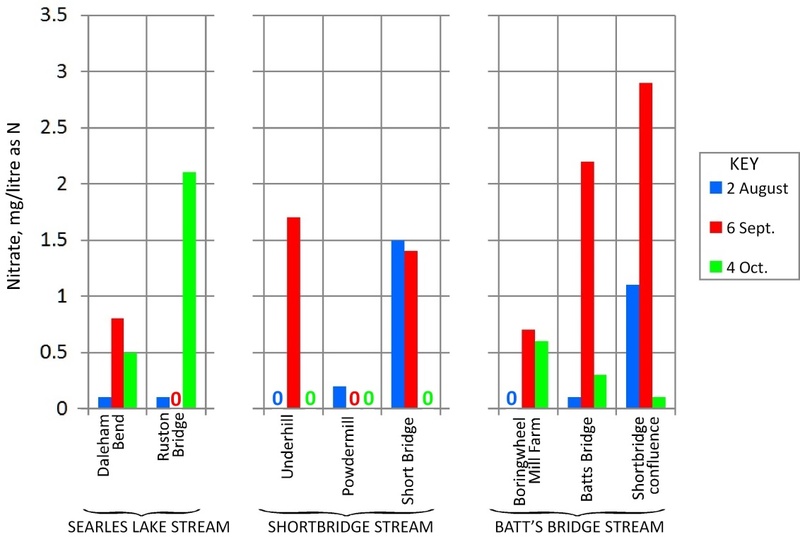 Orthophosphate levels in Searles Lake Stream, Shortbridge Stream and Batt’s Bridge Stream: comparison of samples taken on 4 October with those taken on 2 August and 6 September. Figure 3. 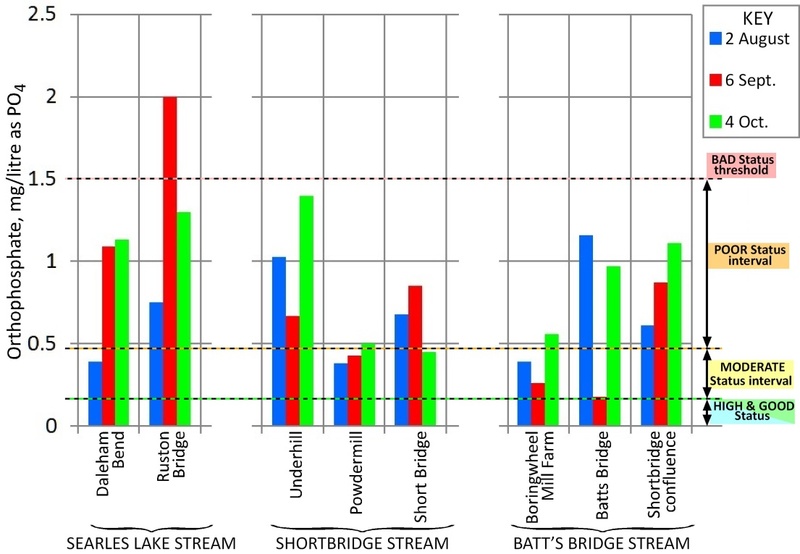 Nitrate levels in Searles Lake Stream, Shortbridge Stream and Batt’s Bridge Stream: comparison of samples taken on 4 October with those taken on 2 August and 6 September. May was a dry month with very few spells of light rain only. Consequently, rivers were running low on sampling day and samplers reported moderate flows of clear water with low turbidity. Ammonia levels were low in June with 2 HIGH, 2 GOOD and 4 MODERATE status values. The highest readings were at Daleham Bend, Powdermill, Short Bridge and Boringwheel Mill Farm. Orthophosphate levels were very high in June with 4 BAD and 4 POOR status values. 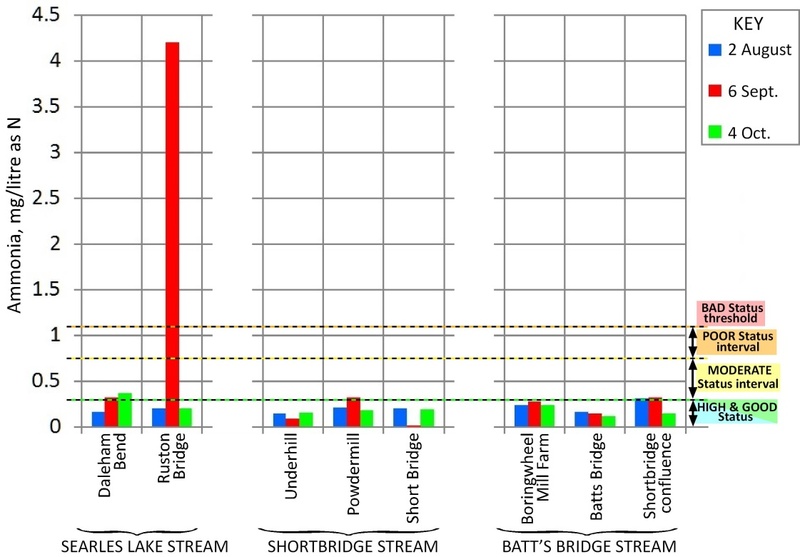 The highest values were at Ruston Bridge, Powdermill, Short Bridge and [Batt’s Bridge Stream] at Shortbridge confluence. 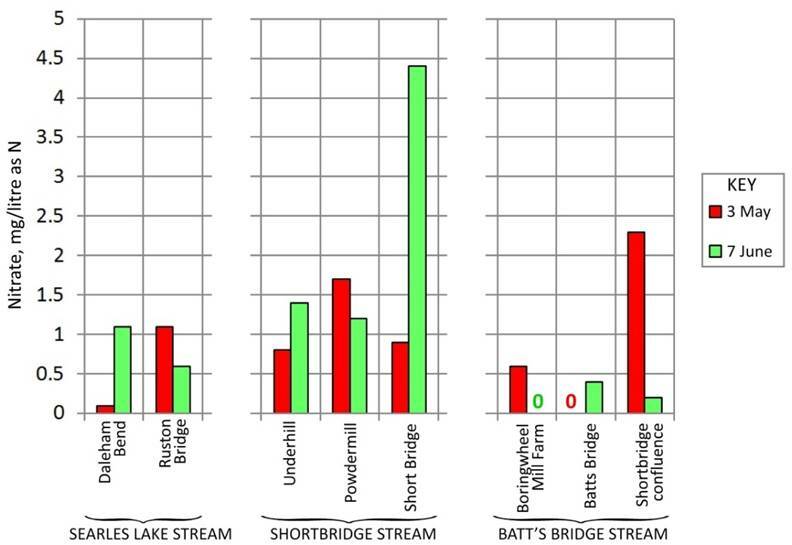 Levels in Searles Lake Stream and lower Shortbridge Stream were higher than last month’s values, while values in Batt’s Bridge Stream were lower. The highest June value was at Powdermill, following a zero reading in May. Dissolved oxygen levels were excellent this month with seven sites achieving HIGH status values and the remaining site at Boringwheel Mill Farm having a GOOD status value. Nitrate values were mostly low with 7 sites achieving a Good ranking. The remaining site at Short Bridge, the lowest site on the Shortbridge system, achieved a Moderate ranking. Values for Turbidity, Conductivity and pH were all within normal parameters, although Turbidity was slightly higher at downstream sites Ruston Bridge, Powdermill and Short Bridge. This second set of results – in common with last month’s results – indicates low levels for ammonia and nitrate and high values for dissolved oxygen. However, orthophosphate results make grim reading with 4 BAD and 4 POOR status readings. The current EA WFD classification (2014 Cycle 2) for orthophosphate in Shortbridge Stream is MODERATE but the last two-month’s results suggest that this may understate the real position. There are no corresponding records for orthophosphate levels in Searles Lake Stream but this survey suggests that levels can exceed POOR or BAD status thresholds on occasion. Following the last two months GOOD or HIGH Ammonia Status values (Figure 1) ammonia levels were again quite low this month, with all sites except Cinder Hill at HIGH or GOOD Status and Cinder Hill just into the MODERATE category. Orthophosphate levels were, again, high this month but mostly not as high as the previous two months results (Figure 2). 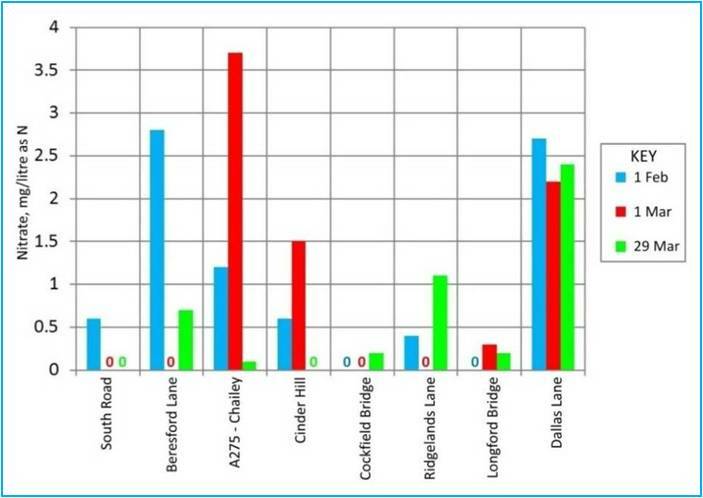 South Road and Cockfield Bridge recorded BAD status, while A275 Chailey, Cinder Hill, Longford Bridge and Dallas Lane recorded POOR status. Perhaps surprisingly, the remaining two sites at Beresford Lane and Ridgelands Lane both recorded GOOD status for orthophosphate despite being located immediately below sites with BAD status for phosphate. Dissolved oxygen levels remained very high this month with HIGH status values at all sites. Nitrate values were mostly Good this month with only the Dallas Lane site recording a Moderate value. Dissolved oxygen levels remained very high this month with HIGH status values at all sites (Figure 3). In conclusion, the past three months results recorded a clean sweep of HIGH status values for DO and mostly GOOD or HIGH status values for ammonia. Orthophosphate values were, however, very high with 7 BAD, 9 POOR, 5 MODERATE and only 3 GOOD results. The very high values at South Road, the topmost site, are a cause for concern – especially the very high value in February. Also noticeable was the coincidence of high values for orthophosphate and high conductivities at South Road; for example, the very high conductivity value in February (1316 µS/cm) coincided with the extremely high value for orthophosphate (53.4 mg/l). The very high conductivity suggests a failing sewage system rather than an agricultural source for the extremely high orthophosphate levels measured in February. Figure 1. 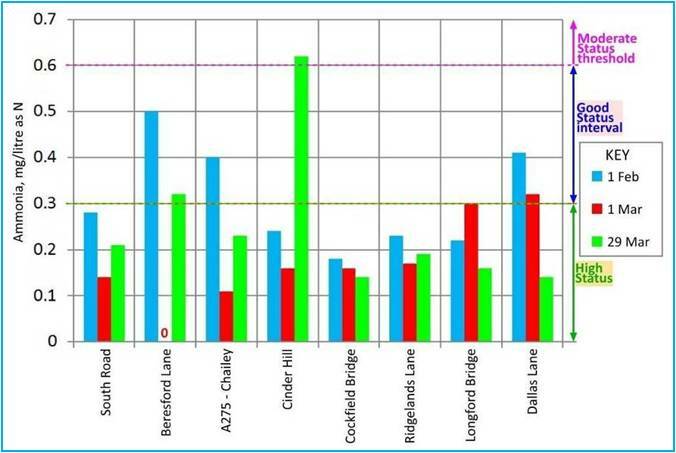 Ammonia levels in Longford Stream: comparison of samples taken on 29 March with those taken on 1 February and 1 March. Figure 2. Orthophosphate levels in Longford Stream: comparison of samples taken on 29 March with those taken on 1 February and 1 March. Figure 3. 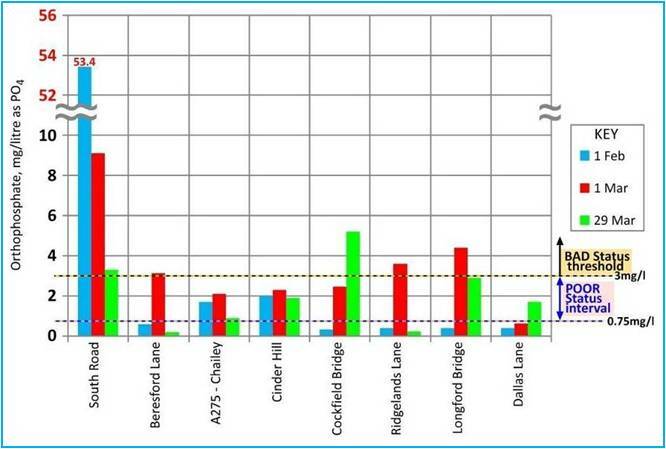 Nitrate levels in Longford Stream: comparison of samples taken on 29 March with those taken on 1 February and 1 March.